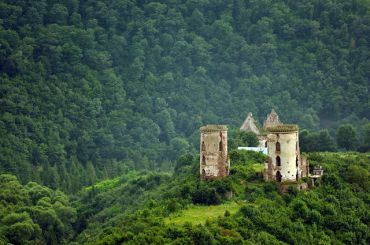 Chervonogrud is the most mystical place in Ukraine, which attracts people with its picturesque nature and mysterious ruins of the castle. 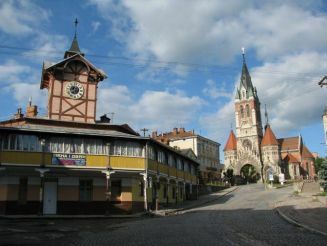 In 1970 this town was removed from the official list of Ukrainian cities, towns and villages. 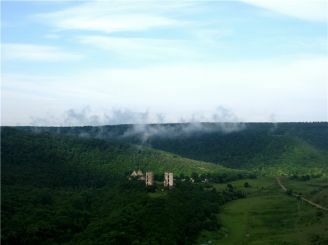 It is located in Ternopil region, between Nahiryany and Nyrkiv villages. More than one century experienced historians and curious tourists come to this place full of legends and riddles. 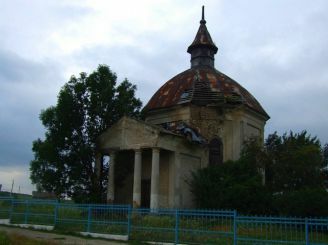 Within the walls of Chervonogrud Castle the wedding of Mykhailo Khmel’nyts’kyi, a father of Bohdan Khmel’nyts’kyi, was celebrated in the 1580s. 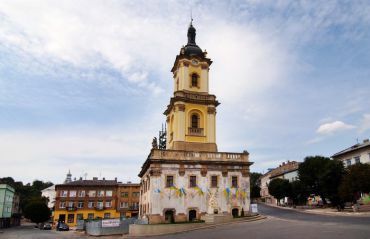 The city history begins in the 9th century, when, according written materials, first wooden fortifications were built on the territory of modern Ternopil region. The city was named due to the fact its grounds changed colour to red while raining. For a long time Chervonogrud used to be the residence of Russian princes and its further history is associated with famous Koriatovych and Buchats’ki-Yazlovets’ki families. In the first half of the 15th century Royal Status and Magdeburg Rights were granted to Chervonogrud. The city and its surroundings became very beautiful in the early 17th century – the period of time when Dominican church of Assumption of the Virgin Mary financed by the Litets’kyi family and a beautiful castle of the old and magnate family Danylovych were built. Unfortunately the castle suffered considerable damage from the Turkish invasions; however it was restored in 1820-1840 by representatives of the noble Ponins’kyi family. 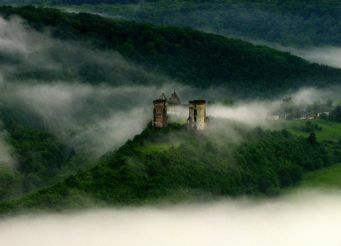 At that time a wonderful palace in the neo-Gothic style appeared on the red hill of Chervonogrud. Castle towers with jagged crowns became the main decoration of the luxurious palace. 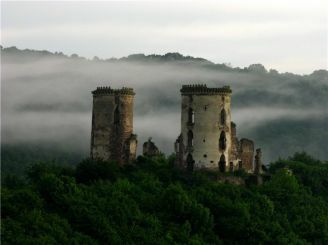 So far, the author of the castle remains unknown. According to different sources it is supposed, architect Pole Tomasz Matlovskyi and L’viv architect Julian Zakharevych have designed it. 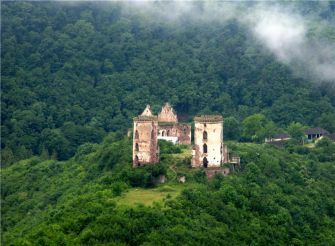 Presently you can see ruins of the old castle and its underground passages, which as locals say can lead you to Porosyachka Cave. According to the legend, a monk used to live in this cave and now it is protected by a headless knight. They say, is not an ordinary cave, but “the Hall of Last Judgment” while underground passages – the way to hell. After all, mystical stories go very well with this place due to its red grounds, towers in mist, where this mysterious silence is broken only with noise of the Dzhuryn Waterfall located near the ruins. The way you can get there is mystical as well. You should go to Nahiryany and Nyrkiv villages, from where you can get to Chervonogrud on your own or hitchhike. Основний маршрут: Тернопіль – Бучач – Язлівець – Джуринський водоспад – Червоноградський замок – сплав по ріці Дністер – Микулинці – Чортків – печера Млинки – Тернопіль. Для получения ярких впечатлений и возможности увидеть незабываемые, красивейшие места, живописные природные пейзажи, древние сооружения, памятники старины, присущие только Карпатам, которые обновят мироощущение и придадут новизну в восприятии жизнеутверждающих впечатлений, предлагаем отправиться в многодневную экскурсию по Буковине и Гуцульщине. For decades, the castle is not reconstructed, but expressed willingness to restore Polish investors. 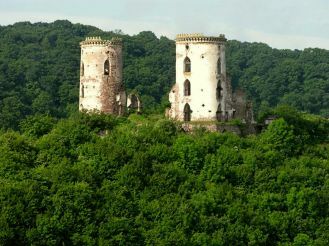 Their interest is explained by the fact that the 18-19 centuries the castle had a family of Polish gentry Poninskyh.